"Have mercy on me, Lord, I am Cuban." In 1962, Carlos Eire was one of 14,000 children airlifted out of Havana--exiled from his family, his country, and his own childhood by Fidel Castro's revolution. Winner of the National Book Award, this stunning memoir is a vibrant and evocative look at Latin America from a child's unforgettable experience. Waiting for Snow in Havana is both an exorcism and an ode to a paradise lost. For the Cuba of Carlos's youth--with its lizards and turquoise seas and sun-drenched siestas--becomes an island of condemnation once a cigar-smoking guerrilla named Fidel Castro ousts President Batista on January 1, 1959. Suddenly the music in the streets sounds like gunfire. Christmas is made illegal, political dissent leads to imprisonment, and too many of Carlos's friends are leaving Cuba for a place as far away and unthinkable as the United States. Carlos will end up there, too, and fulfill his mother's dreams by becoming a modern American man--even if his soul remains in the country he left behind. 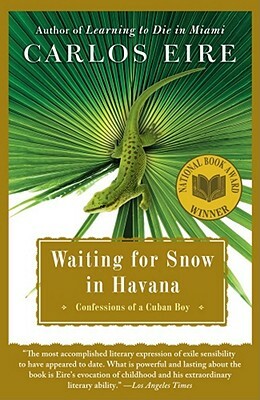 Narrated with the urgency of a confession, Waiting for Snow in Havana is a eulogy for a native land and a loving testament to the collective spirit of Cubans everywhere. Los Angeles Times The most accomplished literary expression of exile sensibility to have appeared to date. What is powerful and lasting about the book is Eire's evocation of childhood and his extraordinary literary ability. The Boston Globe Eire is gifted with what might be called lyric precision -- a knack for grasping the life of a moment through its sensuous particulars....Vigorously written and alive. The Washington Post Bursting with wonderful details and images and populated by characters so well described that they seem to be sitting next to you on the couch. A wistful glimpse of a shattered world.